I’m reblogging this to go with the poem I have just written about her. 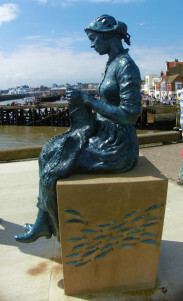 The Gansey Girl is a sculpture by Steve Carvill. It is situated on the pier at Bridlington. 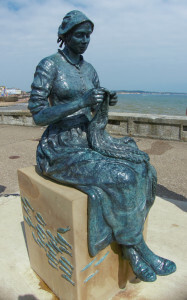 It depicts a girl sitting there knitting while she waits for her man to come back from fishing. Gansey sweaters were knitted by the wives for their husbands. It is an East Riding corruption of Guernsey. A Gansey was normally knitted in blue and white in distinctive patterns. They served two purposes. Firstly they kept the men warm on their long fishing trips out into the frigid North Sea. Secondly they helped identify them when their bodies were washed up. After time in the water the jumper was the only identifying feature. Fishing was one of those working class trades that was exciting, well paid, hard and exceedingly dangerous. It has largely gone now and has been industrialised, mechanised and taken over by the huge fishing companies.